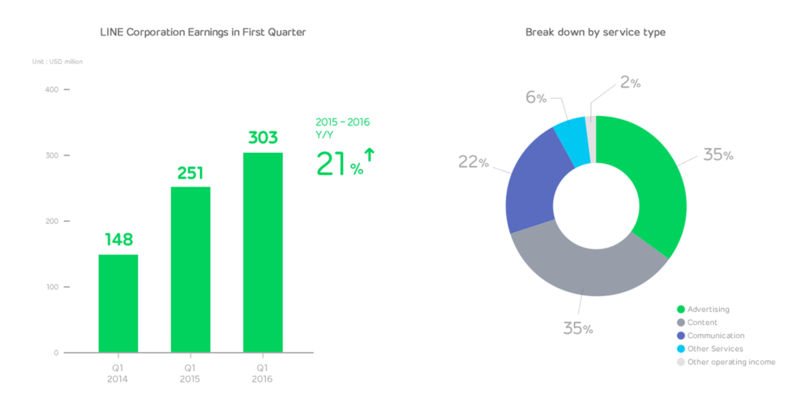 Tokyo, Japan – April 28, 2016 – LINE Corporation today announced their Q1 (January-March) earnings for 2016. LINE Corporation’s revenue*1,2 for the quarter was 303 million USD, a 21% increase over the same quarter in the previous year. Broken down by service type*3, 35% of sales were accounted for by advertising, 35% by content, 22% by communication, 6% by other services, and 2 % by other operating income. Advertising sales have increased from 30% in Q1 of 2015, to 35% in Q1 of 2016, showing rapid growth especially in markets outside of Japan. The revenue for LINE Corporation’s core business, LINE, totaled 275 million USD in the first quarter, a 22% increase over the same quarter in the previous year. *1: Consolidated performance including subsidiaries such as LINE PLUS Corporation and LINE Business Partners Corporation. Content: LINE GAME, LINE MUSIC, LINE PLAY, LINE Manga, LINE Fortune, LINE LIVE, LINE TV, etc. Other: LINE FRIENDS, LINE Pay, LINE Part Time Job, etc. Other operating income: virtual currency breakage income etc. The Monthly Active User (MAU) count for LINE (as of March 31, 2016) totals 218.4 million, a 7% increase over the same quarter in the previous year, with 151.6 million of that total deriving from LINE’s main four countries (Japan, Taiwan, Thailand and Indonesia), a 23% increase over the same quarter in the previous year. LINE is focusing its marketing expenditures on these four countries and from among these, Indonesia showed the most notable user growth during the quarter. LINE also continues to see user growth in the Middle East. Advertising sales in Japan, Thailand, Taiwan and other major markets are growing steadily, allowing LINE to achieve a more balanced earnings structure with revenue more evenly divided across segments. In addition to existing Official Account, Sponsored Sticker, LINE Free Coins and other marketing platform services, LINE has also received positive response from advertisers for its advertising options on LINE NEWS, a news distribution service available in Japan, and the display of advertisements on the LINE Timeline, which started in December 2015. Going forward, LINE is planning to transition to an advertisement distribution system based on Hike, a smartphone native advertisement platform owned by its consolidated subsidiary, M.T.Burn Inc, to begin releasing optimized Timeline advertisements based on more detailed demographics and areas of interest starting in June 2016. LINE GAME, the main pillar of LINE’s content business, released 2 new titles globally in the first quarter of 2016, with a focus on mid-core genres. Meanwhile, LINE Brown Farm, a farming game developed in-house and released in December 2015, has steadily increased users, recording 2,220,000 downloads as of April 6, 2016. At the same time, the on-demand music subscription service LINE MUSIC, in conjunction with the LINE main app, started providing a service in which users could choose tracks available on LINE MUSIC as background music in their profile pop-up in February of 2016, and saw its Daily Active Users (DAU) quadruple. LINE MUSIC will continue to launch campaigns and other initiatives to further increase its user totals. LINE LIVE, a live streaming platform in Japan that provides live video and programming free of charge, has increased its available content through collaboration with movie and television companies. The aggregate total of viewers surpassed 100 million in LINE LIVE’s first three months after launch on December 10, 2015, and the service is being actively enjoyed by a wide range of users. Furthermore the video-on-demand service LINE TV available in Taiwan and Thailand continues to steadily increase users as LINE makes moves to monetize the service. In the Sticker business—the main pillar of LINE’s communication business—sales continue to grow steadily in and outside Japan for both official stickers and Creators’ Stickers. On April 26, LINE also commenced sales of themes in the "LINE Creators Market," enabling LINE users to create and sell their own LINE themes that change the overall look and design of the main LINE app. The new service has received an enormous response, with more than 5,000 themes already submitted. Furthermore, LINE will be releasing new Pop-Up Stickers that fill up the entire chat screen, starting summer 2016. LINE continues to develop its services into a broader platform. “LINE Account Media Platform,” a new LINE NEWS service that allows external media outlets to distribute news by creating an Official Account, has increased its number of media partners to 60 outlets (including 4 internal media outlets) as of March 2016. Furthermore, the main LINE app now always displays news articles at the top of the Timeline, further bolstering LINE NEWS’ user growth. LINE Pay Corporation, provider of the “smartphone wallet” service LINE Pay, launched the LINE Pay Card, a prepaid card, in partnership with JCB Co., Ltd. on March 24, 2016. In just two weeks after opening registration, the prepaid card received over 200,000 applications. LINE Pay Corporation is engaged in various initiatives globally to improve convenience, such as collaborating with Rabbit, an offline payment platform in Thailand which issues smart cards that can be used at offline retailers and for transportation systems, and with Korea’s Shinhan Bank to provide currency exchange and ATM withdrawal services. We saw solid results in the first quarter of 2016, including ongoing user growth in our four leading markets and increases in advertising sales. This quarter we also held "LINE Conference Tokyo 2016". At this press event on March 24, we announced our vision for becoming a “Smart Portal” and promoted our open business platform strategy whereby LINE will act as a gateway for both offline and online businesses and services, beginning in our leading markets. As one part of that strategy, LINE began distributing 10,000 free LINE BOT API Trial Accounts on April 7 to third-party developers worldwide on a first-come-first-served basis. Due to an overwhelming response, we began accepting a second round of applicants for free trial accounts on April 26 after the first 10,000 were claimed in just about one week. LINE has provided a number of bot accounts since August 2011, beginning with weather and translation bots, and there are currently more than 50 bot accounts operated by pizza chains, delivery companies and other external businesses. The further expansion of bot accounts will be one of the initiatives we will undertake in order to realize our Smart Portal vision, among many more initiatives we have in mind for our main Asian markets and the globe.